Not long ago “traveling in style” simply meant first-class transportation, plush accommodations, and dining nightly at five-star restaurants. It was an aspiration that few could ever hope to achieve. But according to the L.E.K. 2017 Luxury Travel Study — a survey of nearly two thousand U.S. travelers — that has begun to change. Across-the-board pampering is no longer everyone’s ideal, and “luxury” now has different definitions for different people. But one thing seems clear: people are willing to spend generously on those aspects of luxury travel that matter to them the most. As the definition of luxury continues to evolve, today’s “luxury traveler” is just as likely to be a Millennial in search of an eco-vacation who is willing to sleep in a bunk bed, as it is to be wealthy globetrotter seeking comprehensive amenities and services. Our study demonstrates that a far broader range of people are eager to make trade-offs to fund luxury, splurging on some items while scaling back on others. 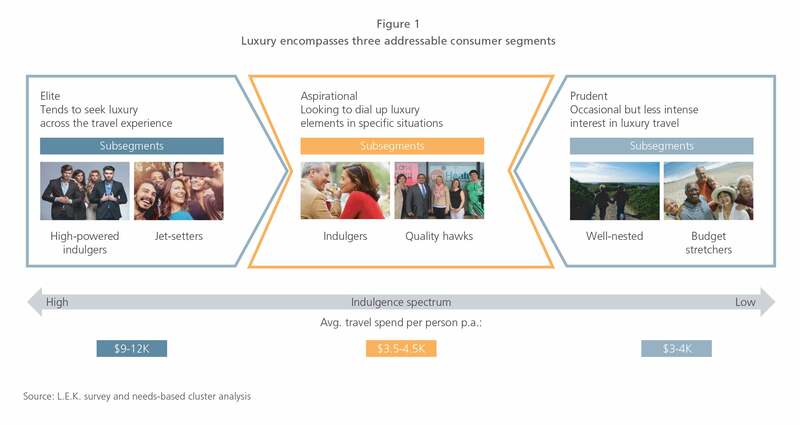 Each of these groups views luxury through a different lens, and each has a different set of priorities, opening up a range of market segmentation opportunities.